In haste, I dropped the pictures that Michelle and I took into an album, here. I'll include pictures from other members when I get them. I'll work on the presentation layer when I get more time. 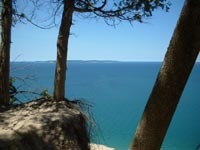 This is a picture of the island from Sleeping Bear Dunes. It doesn't look that far off, but you need to know that here, we are up on top of the Sleeping Bear, four hundred feed above the water. 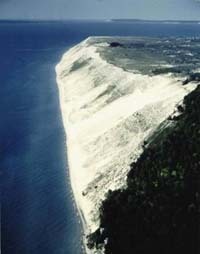 This is a picture of the Sleeping Bear Dune. It's quite a climb up from the water. 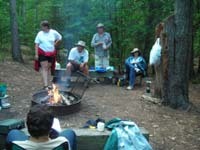 This, and South Manitou Island, are part of the same National Park. 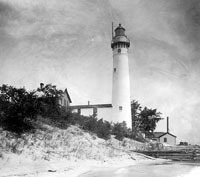 Here is a picture of the lighthouse. We'll be visiting the structrure on a guided tour. This is a recent (1960) shipwreck. The water surrounding the island is a shipwreck museum. There are fifty sunken ships. 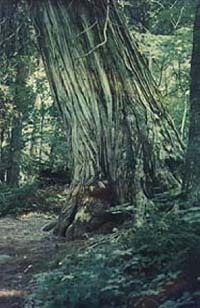 This is an example of the giant cedars that are found on the island. 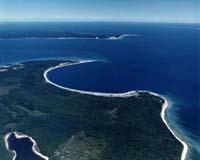 Here's another aerial photo of the island. What a beautiful sight.